100 years on from the Spanish Flu, deaths from infectious diseases have fallen but this should not be cause for complacency. The ILC has launched a global programme, kindly supported via a charitable donation from Pfizer Ltd, that aims to explore the future of infectious diseases and the measures policymakers should take to prevent a future outbreak of an infectious disease pandemic. 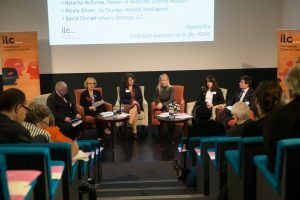 On 8 November 2018, the ILC welcomed 150 delegates, including healthcare professionals, policymakers, journalists and industry stakeholders, to the Science Museum for a panel discussion on the future of infectious diseases. Panel members stressed that the threat of an infectious disease outbreak is very real and that the responsibility does not only lie with policymakers but with all of us as individuals. Simple measures, such as handwashing, vaccination uptake and decreased antibiotics intake to reduce the risk of antimicrobial resistance are key in reducing the risk of a pandemic disease outbreak. The panel concluded that more should be done to raise public awareness of the risk of infectious diseases. 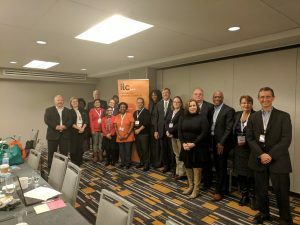 Following on from the panel discussion, we invited a group of experts to a policy roundtable discussion in conjunction with the GSA annual conference in Boston on 16 November to delve deeper into what should be done to raise public awareness of the issue. Key recommendations included that fake news undermining consensus science on vaccinations should be counterbalanced with a strong pro-vaccination voice in the media and beyond. In order to achieve this, messaging should distance itself from scare tactics and offer a positive stance that roots itself in altruism and social justice. Barbara Resnick said that “we all need to be champions” to effect a shift in public awareness. Moreover, industry leaders and individuals in the public eye should contribute by leveraging their reach to launch a public awareness campaign. The programme will result in a final output for policymakers, mirroring the collated views of health professionals, academics, industry leaders, as well as the general public. We are looking to include a variety of different voices, so please share your views with us by e-mailing LilyParsey@ilcuk.org.uk. To keep up to date with the project, watch #SpanishFlu on Twitter and join the debate.